Join us for our Upcoming Five Guys Fundraiser! Updated Thursday August 30, 2018 by Shannon Bilunas. 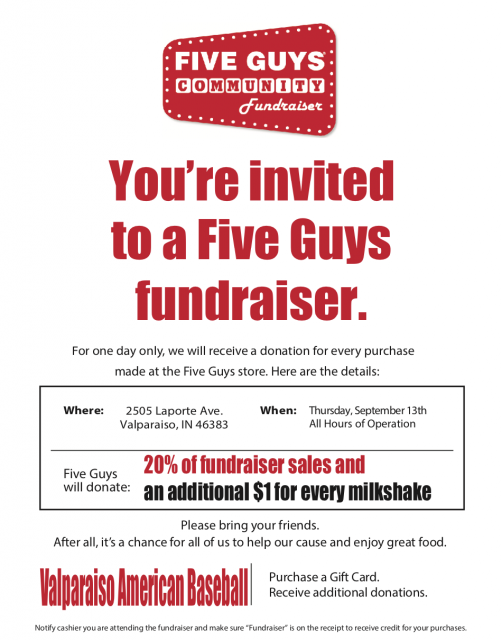 Join us Thursday, September 13th at Five Guys in Valpo for one delicious fundraiser! Stop in and order with the flyer or mention the Valpo Americans Fundraiser, and Five Guys will donate 20% of all sales to Valpo Americans. Five Guys will also donate an additional $1 for every milkshake purchase! Five Guys is located at 2505 Laporte Avenue in Valparaiso.